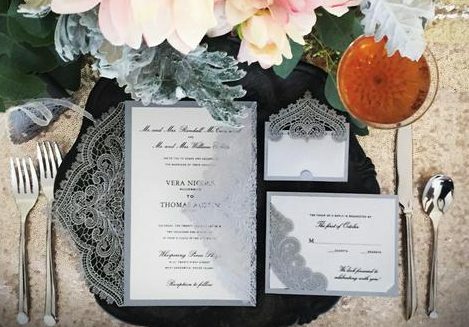 Our new Laser cut Invitations, have the look feel of lace, without all the fuss. They come in a variety of shapes and sizes as well as paper colors to choose from. Some have lasercut jackets, others are flat and lasercut on the edge. We also have all the matching accessory items to complete your party ensemble. Shop in-store or online for a wide selection of Hot and Trendy Laser cut Paper lace invitations. 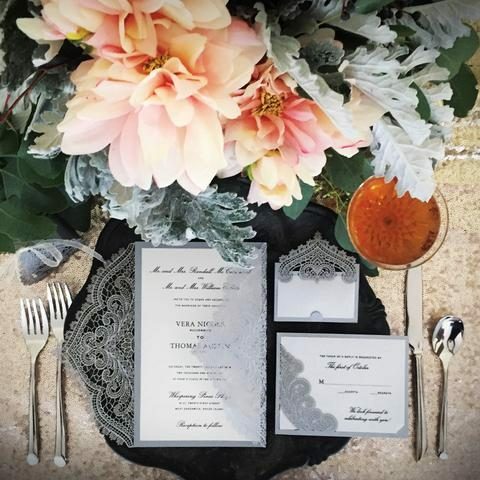 We can coordinate all your matching accessories to your invitation such as response cards and envelope set, accommodation cards, menu’s, programs and placecards. Let us help you dress up your special occasion table with all the other party details like lacey lasercut favor boxes and cupcake wrappers – they really help decorate a table and bring a vintage touch to your decor. Many different paper swatches to chose from makes it even easier to dress up your special occasion. Our favorite is the Chantilly Lace Ensemble featured in this photo. It has a vintage feel, and comes in 6 different card stocks and colors to choose fom. We also have Lasercut Holiday Cards and Photo cards. We believe that every event, from a grand wedding to a dinner party, should be as fresh and distinctive as its host. The tone and atmosphere should be carried through each paper detail, from the invitations and favor boxes to the place card and cupcake wrapper. We pride ourselves on offering stylish products that will inspire you and your recipient alike.